The All Groups CPI rose by 0.6 per cent compared with a rise of 0.2 per cent in the June-quarter 2017. The All Groups CPI rose by 1.8 per cent over the 12 months to the September-quarter 2016, compared to the annualised rise of 1.9 per cent over the 12 months to June-quarter 2017. The Trimmed mean series rose by 0.4 per cent in the September-quarter 2017 (0.2 per cent in the June-quarter 2017) and by 1.8 per cent over the previous year (1.8 per cent for the 12 months to June-quarter 2017). 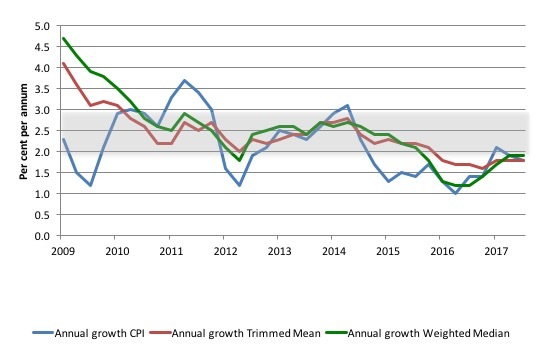 The Weighted median series rose by 0.4 per cent in the September-quarter 2017 (0.1 per cent in the June-quarter 2017) and by 1.9 per cent over the previous year (1.9 per cent for the 12 months to the June-quarter 2017). The most significant price rises this quarter are electricity (+8.9 per cent), tobacco (+4.1 per cent), international holiday travel and accommodation (+4.1 per cent) and new dwelling purchase by owner-occupiers (+0.8 per cent). If anything, the pressure is now on the RBA to reduce interest rates given that their preferred measures (see below) are now well below their targetting range (2 to 3 per cent) and have been for several quarters. What is apparent from yesterday’s inflation figures and the most recent labour market data is that there is plenty of room for further fiscal stimulus. The headline inflation rate increased by 0.6 per cent in the September-quarter 2017 translating into an annualised increase of 1.8 per cent, down from 1.9 per cent in the June-quarter 2017. The trend inflation rate is quite steeply downwards despite the hikes in electricity and gas prices in the September-quarter. Much has been made of electricity prices in the last 12 months as the folly of the various privatisations over the years are now starting to play out. We have seen price gouging, our national grid is teetering on the edge of blackouts (and has blacked out an entire state in 2016), and we have seen private energy companies manipulating generating capacity to create price spikes so as to increase profits. The sooner we take back the essential services into public hands and ban speculative financial transactions on power prices the better. Please read my blog – Market manipulation and electricity blackouts – for more discussion on this point. In the September-quarter 2017, the annual inflation rate dropped marginally to 1.8 per cent despite a massive hike in electricity prices (8.9 per cent) at the beginning of the quarter. Gas and other household fuels rose by 5.2 per cent as the major gas companies export to gain profit and sell into the local market gas they have purchased abroad (ridiculous). These prices are being driven by the wholesale energy market – which demonstrates the failure of energy policy in Australia – it has favoured corporate profits over service delivery. Further, the ABS has done some analysis of the impact of scrapping the Carbon Tax – which was one of the headline policy initiatives of the newly elected Conservative government in 2013 – claiming it would bring down energy prices. The period from June quarter 2014 to September quarter 2017 commences with the removal of carbon pricing. For this period the utilities sub-group rose 9.3%. This was driven by gas and other household fuels (+12.7%), followed by electricity (+10.8%) and water and sewerage (+2.9%). So much for the claim that scrapping the tax would reduce prices. 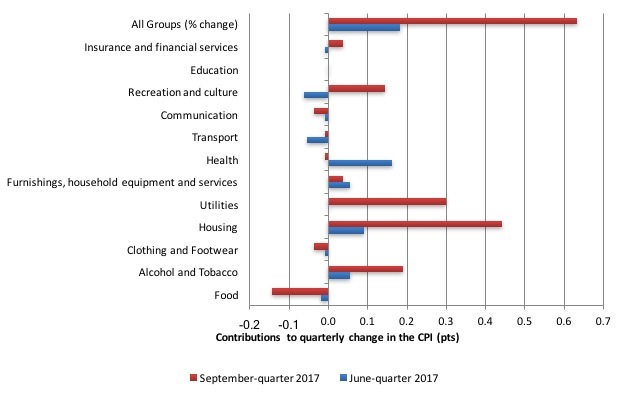 The following bar chart compares the contributions to the quarterly change in the CPI for the September-quarter 2017 (red bars) compared to the June-quarter 2017 (blue bars). Note that Utilities is a sub-group of Housing – and in the September-quarter 2017 the dominant driver of housing cost rises. The most significant price rises this quarter are electricity (+8.9%), tobacco (+4.1%), international holiday travel and accommodation (+4.1%) and new dwelling purchase by owner-occupiers (+0.8%). The most significant offsetting price falls this quarter are vegetables (-10.9%), automotive fuel (-2.3%) and telecommunication equipment and services (-1.5%). I have discussed the energy price rises above. Tobacco prices rose on the back of “the 12.5% federal excise tax increase effective from 1 September 2017” – so a government policy induced rise rather than anything happening in the ‘market’. In the twelve months to the end of September 2017, the major drivers of inflation were Housing (energy prices) and Alcohol and Tobacco Prices. The tobacco and health price rises largely reflect government policy changes. I mentioned at the outset, the on-going inflation obsession among market players. If you examine the market trends in speculative trades then it is clear that the traders have been betting on a major shift in the RBA policy upwards because they have been punting on a substantial rise in inflation. The following graph shows four measures of expected inflation expectations produced by the RBA – Inflation Expectations – G3 – from the June-quarter 2005 to the September-quarter 2017. The most reliable measure – the Break-even 10-year inflation rate – is now at 1.8 per cent, well below the lower bound of the RBA targetting range but spot on where the actual raw inflation rate came in at. 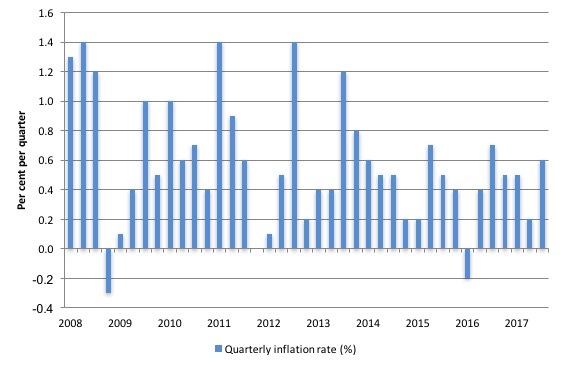 It has falling rapidly towards the actual inflation rate in the last few quarters, reflecting the relatively weak state of the Australian economy. The other expectations are still lagging behind the actual inflation rate, which means that forecasters progressively catch up to their previous forecast errors rather than instantaneously adjust, a further piece of evidence that refutes the mainstream economics hypothesis that we have ‘rational expectations’ (that is, on average get it right). Clearly, the market economists have been punting on a rise in the interest rate. But the inflation trends highlighted in last week’s data release provide no basis for that expectation nor for the RBA hiking interest rates anytime soon. 1. 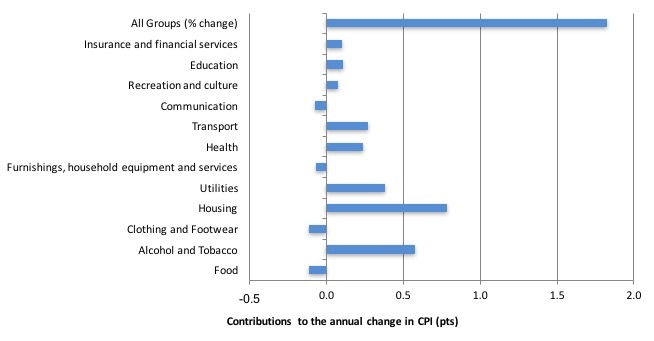 CPI measure of inflation – 1.8 per cent and below the RBAs target band for the last two years. 2. The RBAs preferred measures – the Trimmed Mean (1.8 per cent and stable) and the Weighted Median (1.9 per cent and stable) – are also below the lower bound of the RBAs targetting range of 2 to 3 per cent. First, the ABS will realise that the energy price hikes (up to four times the overall inflation rate) are not a reason to hike interest rates. They do not signify an overheating economy but rather price gouging and a failed energy policy, that will have a negative impact on economic activity. Second, there is clearly a downward trend in all of the measures. The “core” measures used by the RBA have been benign for many quarters even with a relatively large fiscal deficit and record low interest rates. They are now trending flat. Second, it is clear that the RBA-preferred measures are well below the lowest inflation-targeting band rate of 2 per cent and have been since the end of 2015. The RBA will also be mindful that real GDP growth is still below trend and the labour market is still in an uncertain-to-vulnerable state, with broad labour underutilisation still above 14 per cent (or more). Please read my blog – Australia – real wages growth zero and the rip-off of workers continues – for more discussion on this point. 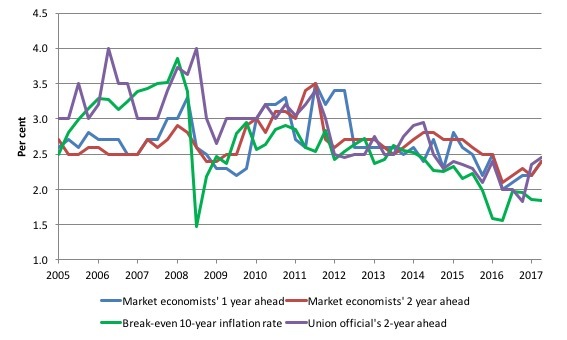 The inflationary expectations of the union officials (see graph above) are also not signalling any major breakout, which might drive higher wage demands. My view is that the RBA should cut rates now that all three measures have been consistently below the targetting range. It won’t but it also will not be hiking rates anytime soon. And the market economists will be wrong again. With unemployment now falling yet wages growth flat and inflation benign – a global phenomenon – there have been questions raised about our usual understandings of these relationships. Some years ago (2004) I wrote a paper which explored the notion that a declining unemployment rate no longer provided the same signals for inflation trends as it might have done in the past. Specifically,I hypothesised that with the rise of underemployment accompanying the casualisation of the labour market in the neo-liberal era, “within-firm” measures of labour slack were now likely to be an additional way in which wages growth was suppressed. In other words, you had to consider the broader measures of labour underutilisation in a study of inflation. These ideas coincided with the development of my broader hours-based measures of labour underutilisation which were published as the CofFEE Labour Market Indicators – I discontinued that work after the ABS took the lead and started publishing underemployment and broader labour underutilisation indicators. Recall that the Phillips curve links the unemployment rate and inflation based upon the notion that unemployment is an inverse proxy for labour market pressure – so excess labour supply was considered to be a key variable constraining wage and price changes. However, if the way in which the labour market slack manifests changes – to include slack within the firm (underemployment) as well as slack that is external to the firm (unemployment) – then the earlier approach to studying the Phillips curve will miss out on important factors that may help to explain inflation. Specifically, a falling unemployment rate may be offset (more or less) by rising underemployment. As a consequence, if the policy makers are attempting to gauge inflation pressure by examining movements in the unemployment rate (that is, the NAIRU type approach) they will overestimate the tightness of the labour market when there is signficiant underemployment. The point is that over the the last several decades, the relationship between inflation and unemployment has been unstable and during the periods of stability it has been fairly flat – implying disinflation policies are very costly. 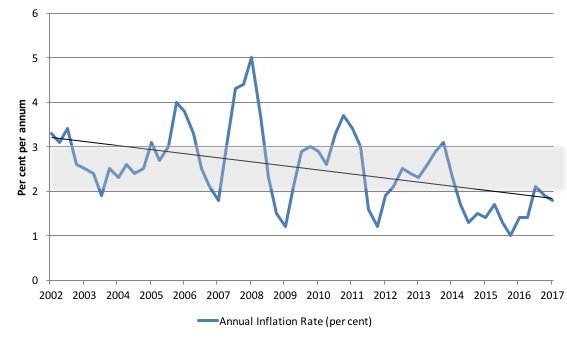 Please read my blog – Inflation targeting spells bad fiscal policy – for more discussion of the sacrifice ratios involved in using unemployment to discipline inflation. In earlier work (2004) I tested several interesting testable hypotheses at that time about how the changing labour market impacted on the inflation generating process. I have updated that work (which will come out soon in the academic press) and the summary results of one part of the research are presented below. First, the standard Phillips curve model predicts a significant negative coefficient on the official unemployment rate (a proxy for excess demand). I found that in the sample tested (February 1978 to September 2017), the unemployment rate in a typical Phillips curve model exerted a statistically-significant negative influence on the rate of inflation. Second, when I added an underemployment variable I found it exerts negative influence on annual inflation with the negative impact of the UR being reduced. The underemployment impact is much stronger than the unemployment impact. The point is that even though unemployment has fallen in Australia since the worst period of the recent downturn, underemployment has not falling much and rose sharply as the economy slowed. The inflation discipline coming from the labour market is at present fairly strong and that is why I conclude there is not significant inflation threat coming from that source. Australia is now a member of the low-inflation/deflationary brigade as a result of our austerity-obsessed national government. We are skating along at below-trend growth rates and tolerating elevated levels of labour underutilisation. A sort of slow death. Something has to give in the policy debate which remains dominated by a supposed need to record fiscal surpluses. One thing that comes out well on a graph is the inverse relationship between interest rates and private debt. The higher the private debt the lower the interest rate. Due to monetarist economic policy, the level of private debt peaked in most countries at the boom phase of the GFC and has not fallen very far since. Central banks moved in to shore it up with QE. Professors Steve Keen and Micheal Hudson have done some great work on private debt and how it erodes aggregate demand and thus causes “debt deflation”. In Nz today, inflation 1.9%. Still doesn’t stop comments from msm about how massive inflation is about to be unleashed with rate hikes that will accompany some huge stagflationary episode caused by the new government . I fixed the mortgage for another year….but I doubt they will be lifted. Increasing interest rates causes inflation and weakens a currency. They are price adjustments, pure and simple. Higher rates equate to higher prices and higher prices mean higher inflation. Inflation is not good for currency. Higher inflation is good for inflation-sensitive stuff like gold and commodities as well as some stocks. The data since the FED started hiking proves this. Just pick a graph, any graph. The price increases get passed on right across the economy. Currencies are a bit like bonds, the only difference being they have zero maturity. Everyone seems to understand that when rates go up bond prices go down. It’s an inverse relationship. The discount to par reflects the implied yield and that discount increases as rates go up. Of course this does not reflect short-term portfolio shifts based on traders’ beliefs. Many believe that lower rates are bullish for gold or bearish for a currency and vice-versa. As a result, they act on those beliefs and buy and sell accordingly. However, that’s not the true fundamental effect. That’s why so many people lost money buying gold when they believed rate cuts would be inflationary. Similarly, they wrongly sold the dollar. These mistakes are being repeated now, only in reverse. The Fed thinks it is fighting inflation when actually it is feeding it via these rate hikes. Any commodity curve will show this in reaction to a rising-rate environment. The curve will instantly reflect higher future costs. In addition, their policy and statements seem to reflect a lack of understanding of the government being a net payer of interest. They talk about being on guard against further fiscal stimulus when it is the Fed itself that is doing the stimulating. It is paying. That is income added, not removed. While some may find it harder to borrow because of the higher cost of credit, that is offset by the additional income earned by creditors and savers. There is net income received by the economy and that is by no means a brake on economic activity. Of course none of this is supposed to happen right !!! Not if you completely ignore the interest income channels it isn’t and you don’t beleive that the FED is the price setter and that price increases gets passed on. You don’t beleive rate hikes increase deposits. Of course if you cut interest rates the opposite is true. Russia is a great example of what happens if you cut interest rates. The Ruble was one of the strongest currencies last year and their inflation rate dropped from 6.1% to 3% after cutting interest rates from 11% to just above 8%. Central banks think if they increase their interest rates it fights inflation. I’d like to see them prove it considering all the data shows the reverse is true. Inflation bottomed out Dec 2015 when the FED started hiking that was no coincidence. I’m not talking about hyperinflation here far from it but when you raise interest rates the inflation rate will move upwards.. This brings the year-over-year increase the highest in five years. Is there no positive side to QE ? ie Allowing Australian banks to meet their reserve requirements through RBA funding as opposed to global markets ? During the time in which the Fed conducted QE. On aggregate personal interest income did not grow. It went from $1.4T annually in 2008 to just under $1.4T in 2015. The Federal debt went from $11T in 2008 to $19T in 2015. So the debt rose by $8T and there was no increase in personal interest income. People were holding $8T more interest bearing securities yet on aggregate they earned not a penny more. The Fed was stripping it out. The Fed’s earnings on assets went from about $20 billion annually in 2007 to over $100 billion annually by 2015. That’s interest income that would have gone into the economy, but instead it went to the Fed. Madness when you think about it. I’m not sure but I am starting to believe that after the crash when they knew the automatic stabilisers were going to kick in and pushed the deficit all the way to 10% of GDP. QE was actually used to help control inflation. Yet, they still to this day call QE a fiscal stimulas. If the mainstream believe that increasing interest rates fight inflation and make a currency stronger then the Onus is on them to prove it. No matter what data you look at it is not the case. The Bank Of England are about to raise interest rates tomorrow because they believe it will fight inflation. Hence, there lies the problem. Could we also argue that currency value also affects inflation and rates? For instance, the RBA has been stating for quite some time now that a higher AUD will dampen inflation, and sure enough after sitting above 78 for a few months we get these most recent poor inflation numbers. My reasoning suggests, at least from the currency affecting inflation etc angle, that higher AUD means cheaper imports which means less domestic spending. Not really but maybe on the margins. Bill has covered this in the past. Pass through inflation because of the exchange rate is not what it used to be. Got to be careful with that simplification. It misses the non-linearity of the feedback loop on the spending flow. If the government sector is paying higher interest rates you get a net add of interest to the economy, but the increase in the price of money reduces the number of worthy borrowers which reduces the balance sheet expansion of the banks and may reverse it. On top of that is the redistribution from borrowers to savers which tends to be a flow reduction (savers don’t spend as much as borrowers). Monetary policy changes have extremely uncertain distribution characteristics. There are too many moving parts. Why should home owners pay more in interest rates because of rising inflation due to rising costs ? Is this not a double whammy ? higher costs + higher costs ?